In response to the overwhelming tragedy of the explosion of the Columbia space shuttle, an American quilter, Becky, started coordinating efforts to make one comfort quilt for the family of each astronaut, i.e. 7 quilts in all. The guidelines were for a 10" finished block. Other quilters contributed batting, backing, and money for postage. A Yahoo group (comfort squad) was created for the purpose of having one central contact point. The group has since changed to being a general charity quilt group. Unfortunately, I didn't keep notes of the quilt coordination process and although I was aware of an online news article from the Alexandria-Pineville, Louisiana "The Town Talk" that specifically spoke of these quilts. I was able to obtain a copy of the article *and* ... miracles of all miracles ... I found Marge Harrington, the lady who spearheaded this quilt's constuction! She graciously sent me a photo of the final quilt *and* a copy of the newspaper photograph! KINCAID LAKE - The tragic loss of the astronauts aboard the space shuttle Columbia as it reentered the atmosphere on Feb. 1, moved a Cenla quilter to remember those lost on that tragic day. Marge Harrington, who lives on Kincaid Lake, began discussing with her fellow quilters of the online Patience Quilters group, about making a quilt and sending it to NASA. The commemorative quilt idea was well received and quilters from all over the United States and one from Finland, combined their efforts, making dozens and dozens of colorful quilt squares. There were so many, in fact, that it was decided to make quilts for the families of each of the seven astronauts. 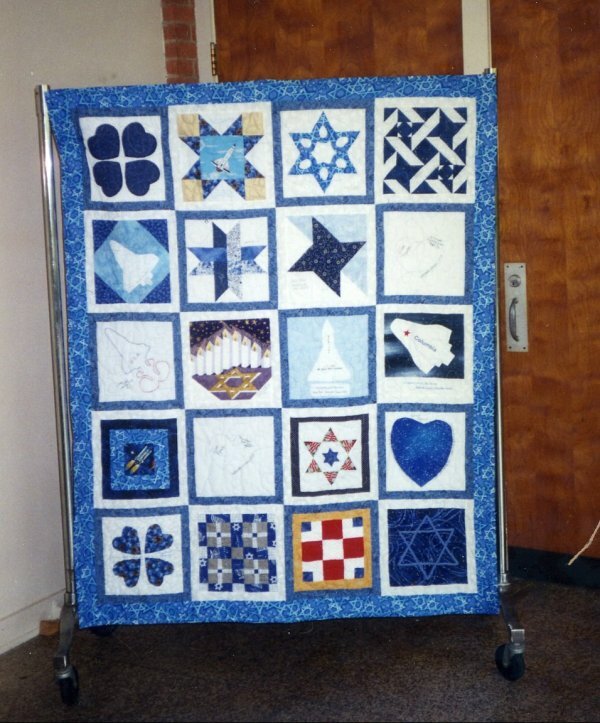 In Harrington's case, her quilt was specifically designed in memory of Israeli astronaut Ilan Ramon. On it are squares featuring the Star of David, a menorah, images of stars and outer space and the Columbia and other images related to Ramon and his background. "I chose (Ramon) because I had read a story in the paper about Rabbi (Arnold) Task, who said he knew the rabbi used by Ramon and his family," Harrington said. 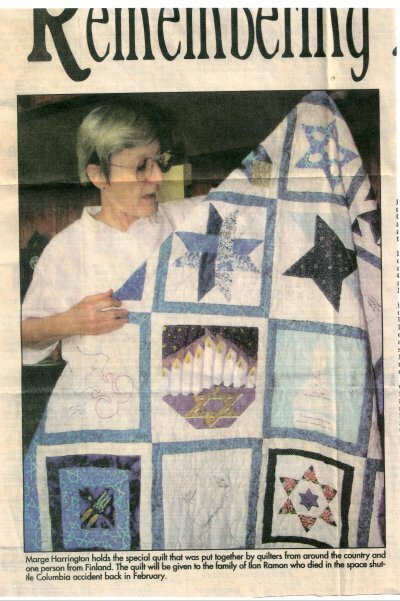 She said her favorite square on the quilt was of a detailed menorah and Star of David designed by Shelley Rodgers of Walnut Creek, Calif.
"She put so much work into it," Harrington said, as she admired the quilt square. Virginia Domico of Tioga did the stitching, she said. Harrington said she also contributed to the quilts of the other astronauts - Laurel Clark, William McCool, Michael Anderson, David Brown, Kalpana Chawla and Rick Husband. "I did a silhouette of the state of Louisiana and for the naval people aboard the shuttle, I designed sailors and anchors," she said. Clark, McCool and Brown all served in the U.S. Navy. Harrington said she is impressed at how well the Columbia crew quilting project came together. "It's so amazing that people from all over the world took the time to create something to honor and commemorate someone's life," Harrington said. Harrington said she believes there will be a Columbia crew memorial plaque unveiled in June at the Kennedy Space Center at Cape Canaveral, Fla.
"I'd really like to be in Florida to give it to them," she said. I made a menorah block for the quilt of Ilan Ramon, the Israeli astronaut. 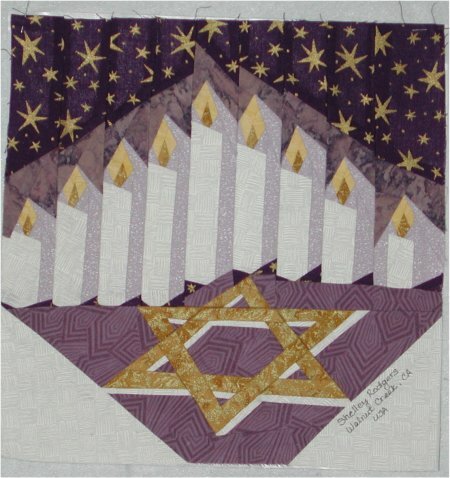 The paper pieced pattern came from Paper Panache and is still available as the Hanukkah Block, #510HB. I sent the finished quilt to a lady in Florida who was supposed to present it at the dedication. We never heard if it was given to the family or a representative. Rabbi Task never mentioned that he heard anything either. I would have loved to know what became of it and the others. I still live on Kincaid Lake and the Patience Quilters except for Virginia did not help. The quilt hung in the fellowship hall at the Jewish Temple here for several weeks and friends of mine who belong to the Temple told me it got very high praise. And here is a picture of the completed quilt. It is simply gorgeous. I'm so happy to have been a part of its construction. The next part of this Quest is to see if I can find the lady in Florida to whom the quilt was mailed for the presentation. In my email correspondence with Marge, she thought back and had vague memories of the name "Mary Lou Weidman" but wasn't sure. So, my inquiries continue. Should anyone Out There know any information regarding the final outcome of this quilt or the presentation, I would be ever so grateful to talk with you.